Berkeley is where I learned to love Indian food, no doubt thanks in part to my Andhra Pradeshi roommate. In fact, I still remember my first taste of tandoori and tikka--it was with the roomie's family at a place called Raja on University Ave (now shuttered, replaced by India Palace). One bite, and I was hooked. Of the myriad of Indian eateries dotting the City though, Vik's clearly stood out above the rest. Why? 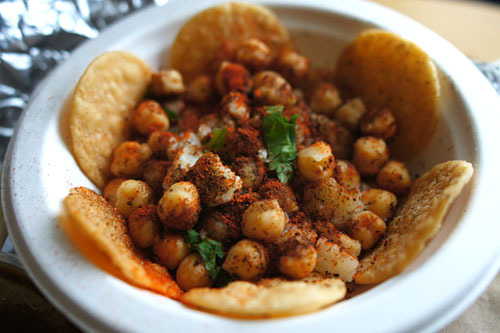 Unlike most Indian restaurants here in the US, which specialize in the typical array of Northern/Mughlai/Punjabi dishes, Vik's focuses, as its name implies, on chaat. The term chaat refers to a variety of small savory snack items, typically sold from carts or stalls--"street food," if you will. Vik's is the brainchild of one Vinod Chopra, who, in 1989, decided to devote a small "corner" of his Indian grocery to serving the wonderful chaat of his childhood, a cuisine concept nearly unheard of at the time. Chopra's wife, Indira, was initially opposed to the idea, but as the popularity of Vik's grew tremendously over the following years, establishing an almost cult-like following in the process, she gradually warmed up to the idea, and even began contributing her own recipes to the burgeoning restaurant. And thus, like this, Vik's has persisted for over 20 years under the leadership of the Chopra family. Today's, it's Vinod and Indira's son Amod who handles most of the day-to-day operations. It turns out that my visit to Vik's was well-timed. Over the years, Vik's has expanded its physical space to accommodate an ever expanding customer base. However, in February of this year, the restaurant underwent its largest transformation yet, moving to a much larger location about two blocks south of the former spot on Allston. To be sure, the vibrant, vermilion-tinted building, enshrouded in the heady aromas of chutney and chole, is a far cry from the depressing digs of the old storefront. Inside, things are even more divergent. Gone are the dreary green-on-white walls and dilapidated fixtures of the old Vik's Chaat, replaced by bright, cheery shades of marigold, punctuated by gleaming swaths of stainless steel. You still queue up to order, but the line can snake around the room now. Fortunately though, it moves briskly, and you'll find yourself at the ordering counter in no time. And here we are. 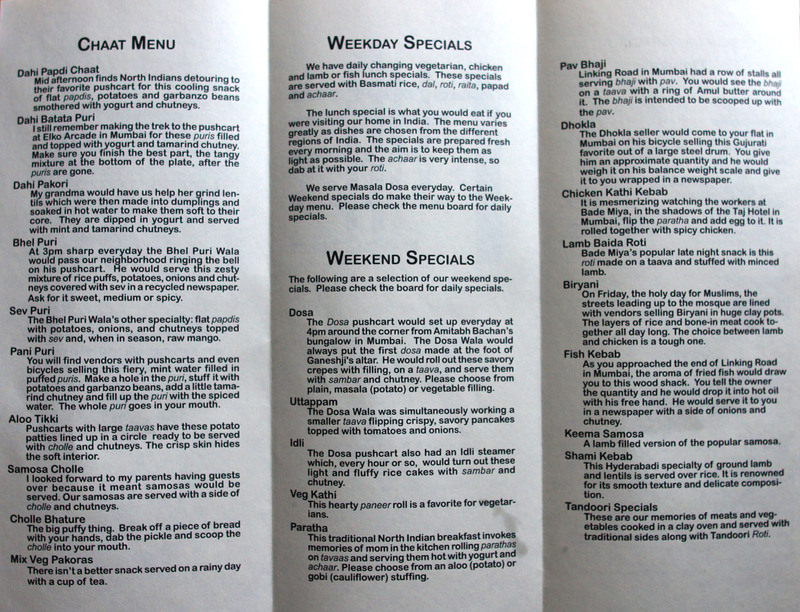 The menu, fortunately, is pretty much the same as before, with a bit over a dozen dishes during the week, and around two dozen on weekends (as was the case on this visit). 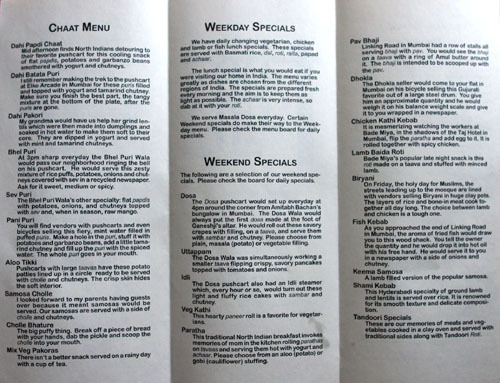 However, if the board seems inscrutable, you can always pick up some printed menus (replete with florid, J. Peterman-esque prose) for guidance. Click for larger versions. Once your order is taken, it's zapped to screens in the now massive kitchen area, replete with special stations for chaat, tava, bhatoora, and the like. A man calls your name, and you quickly head over to pick up your booty. Your next task: finding a seat! 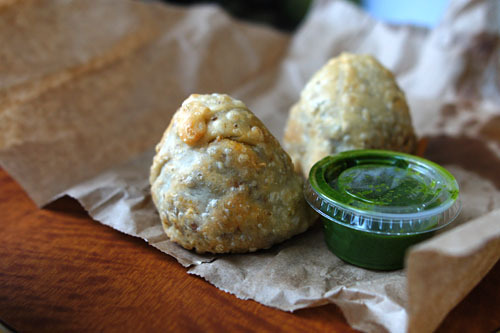 We began with a lamb-filled variant of the most popular chaat out there: a samosa. The spicy, succulent ground lamb was a welcomed change to the typical filling of mashed potato, and I really appreciated how the use of peas helped to balance the inherent heaviness of the dish. Delicious on its own, but even better when dipped in the paired mint chutney. 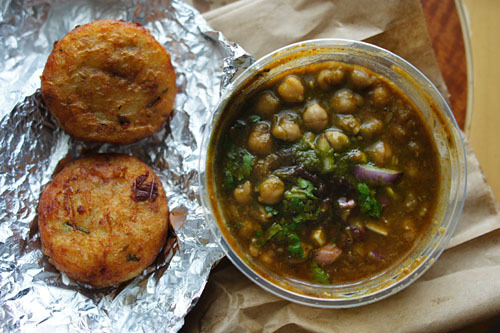 Aloo tikki are small spiced potato patties made on the tava, a type of griddle. These come from Indira Chopra's recipes, and eaten by themselves, they were almost hash brown-like in essence (and I love hash browns!). The best part of the dish, though, was the chole masala, a fantastic spicy-savory-sour preparation of chickpeas that I absolutely adored. Consuming the pleasantly pungent stew with the relatively mild potato was a sublime eating experience indeed. 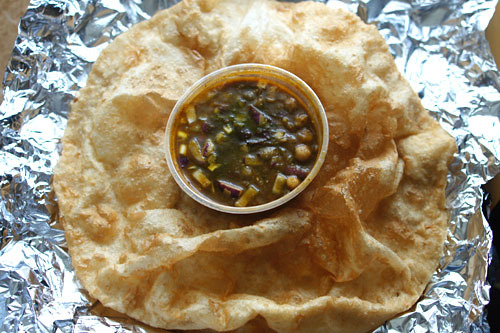 Papdis, or papris, are small disks of fried dough. Here, they're served with an amalgam of potato, garbanzos, yogurt, and chutney. This was a light, refreshing dish, with a great textural interplay between the crisp papdis and soft, subtle potato, while the garbanzos added an appreciable gravity to things. First timers at Vik's are often left in awe by the bhatooras, the big puffy masses of fried bread as big as your head (unfortunately, ours had "deflated" already). Made from a base of maida, or white flour, the bread is a soft, elastic, chewy treat with a subtle sweetness--in fact, its sapor reminded me of Chinese style you tiao! The bhature was accompanied by more of that tremendous chole. 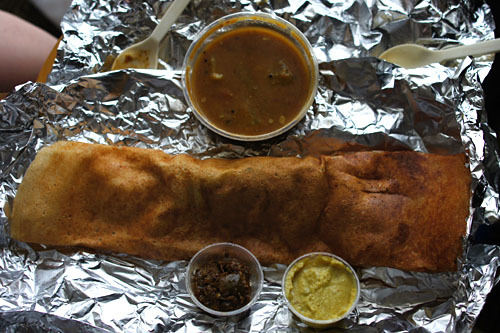 And now for that staple of South Indian cuisine: the ubiquitous masala dosa, a rolled crepe, made on the tava, and filled with a delightful spiced potato mixture (note: see Annapurna for many more types of dosas). The pancake itself was a bit sweeter than I was accustomed to, so the lightly piquant potato stuffing and sambar, a lentil soup, were absolutely key. 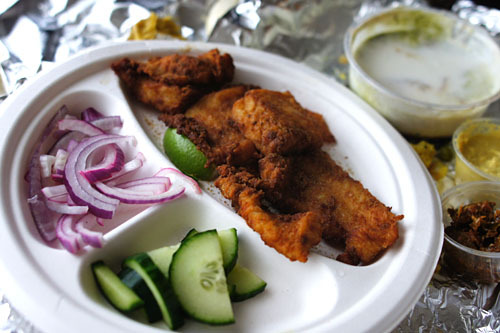 Koliwada refers to a community inhabited by fishermen (kolis), and thus we have here a quartet of sea bass fillets, spiced, coated with gram flour, and fried. The result was a fine, tender, savory preparation of fish, brightened up by the accompanying veggies and chutneys. Nice. What can I say? Vik's continues to deliver. There's a reason why the place is beloved by, and jam-packed with, people from all walks of life--students, hippies, yuppies, Indian families, professors, white collar, blue collar, foodies making the pilgrimage--there's seemingly something for everybody. The food is at least as good as that from fancier and costlier places. It's simultaneously spicy, savory, sweet, sour, messy, chaotic, jarring, out-of-the-norm, beloved, in short: it's Vik's. Oh wow, this is my first time seeing their new location. I'm a big fan of the chicken biryani and lamb baida roti. How about the entry for biranyi? Being sold all day long outside Mosques on Fridays. What does that have to do with anything? This is pure puffery and marketing designed to magically transport you to India as you close your eyes and take a bite. Like I said, the food looks delicious and the place is humming. 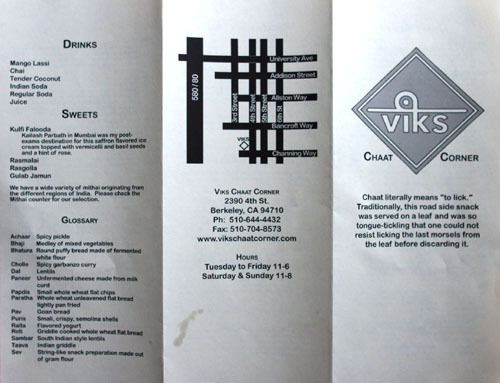 I am going to Vik's this weekend. There are so many places I want to try before leaving Berkeley :P Maybe I should come up with a list of "must go" restaurants near Berkeley?! Jai: So how does Vik's fare in your ranking of Berkeley Indian restaurants? gtrine: Me too--it's been a while since I've had a good pani puri. Is it your favorite item there? Helen: When are you going, and what places do you have planned? Betty: So how was it? Where else do you want to try in Berkeley? I should've gone to more places while I was still there! I absolutely loved the Koliwada Fish and Masala Dosa! Compared to the other Indian restaurants near campus, this one is decent. Well, I actually have a list of places to try before I leave Cal. Hard for me to rank them since it's been a while, but my favorites for non-dosas are Chaat Cafe, Vic's, Ajanta, and Breads of India. That said, none are comparable to homemade Indian food :) For whatever reason, Indian restaurants can never live up to authentic home cooking. Jai: Nice selections. I used to walk over to Chaat Cafe (and it was quite a walk) all the time to get their desi chicken wraps. Is Gregoire the place on Cedar Street(near Shattuck)? My friends recommended Cesar as well. I fell in love with Spanish food after I tried Bazaar in LA last time. By the way, I am going to be in Japan for 18 days next month after graduation. Are there any restaurants you would suggest to try while in Japan? As for Japan, I don't have much experience there. However, if I were to go again to Tokyo, I'd want to see what the fuss is all about at Mizutani and Jiro, if I could get in. Les Creations de Narisawa, Ryugin, and Quintessence are other places I'd keep in mind. For Kyoto, kaiseki is the way to go--maybe check out some of the 3-star places? Continuing the thread on Indian food in NorCal, a definite recommendation would be Sakoon in Mountain View. They have tasting menu designed by Sachin Chopra and even have a sommelier at hand to pair your selection of Indian food with the right wines. I tried the Non Veg tasting menu and it was divine! Kunal, I remember you emailing me about Sakoon earlier in the year. You went in May right? The menu seems very ambitious, which is a good thing in my book.